A former Avon lady has been found guilty of manslaughter after stabbing her partner at the home they shared in Dunstable. Angela Ayre, 74, was cleared of murder but convicted of manslaughter yesterday (Tuesday, January 15) following a two-week trial at Luton Crown Court, after stabbing Mark Evans, 53, at a property in Redfield Close in March 2018. Police were called at 11.12pm on Thursday, March 8, to reports of concern for the welfare of Mr Evans, but he was pronounced dead at the scene. A post mortem was carried out which revealed he died as a result of a single stab wound. 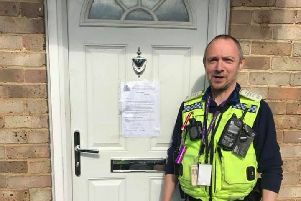 An investigation was launched by the Bedfordshire, Cambridgeshire, and Hertfordshire Major Crime Unit (MCU), and Ayre was arrested, giving a ‘no comment’ interview, and was subsequently charged with murder. She has been bailed ahead of sentencing at Luton Crown Court on Tuesday, February 15.